The Science Of Surviving A Fall : Shots - Health News Sometimes people who fall great distances survive. How do they get so lucky? Scientists share the secrets of an implausible safe landing. Falling from an airplane would ruin most people's day. But if you're James Bond, it's no big deal. After getting pushed out of a plane in the 1979 film Moonraker, Bond initiates a midair fight with a nearby skydiving villain and takes the evildoer's parachute. As his enemy plunges to the ground, Bond fights off a second bad guy, deploys his chute and floats gracefully to Earth. Piece of cake. I remember seeing that scene as a kid and being pretty impressed. But I couldn't help but wonder: What happened to the other guy? You know, the villain who lost his parachute. He's totally dead, right? As it turns out, maybe not. A handful of lucky people have survived similar falls in real life. Author Jim Hamilton has compiled dozens of these stories. For instance, Alan Magee survived a 20,000-foot fall from his plane during World War II and survived by landing on the glass roof of a French railroad station. And Serbian flight attendant Vesna Vulović holds the Guinness world record for the longest survived fall — over 30,000 feet — after her plane blew up in the 1970s, though some cynics think the real height of Vulović's fall was a mere 2,600 feet. But how exactly do you survive such an extraordinary event? Rhett Allain, associate professor of physics at Southeastern Louisiana State University, says that experimental evidence on the subject is thin because it's unethical to throw people out of airplanes for science. "Fortunately, we don't have enough data to make a trend line," Allain says. Still, Allain and others have a few ideas about the factors that might determine whether you survive a tumble from thousands of feet in the air. According to Allain, there are a few things you need to do. This is one situation where size really does matter. "Smaller people are going to fall slower, so that's going to give them a better chance [at survival]," explains Allain. You've probably witnessed this phenomenon if you've ever brushed an insect off your kitchen table. A 3-foot fall is pretty intimidating for something as small as an ant. But the ant survives. How does it do it? The answer has to do with the two main forces acting on a falling person — gravity and air resistance. You may remember learning in physics class that gravity accelerates all objects at the same rate, regardless of mass. So how can it be that a heavier skydiver will fall faster? 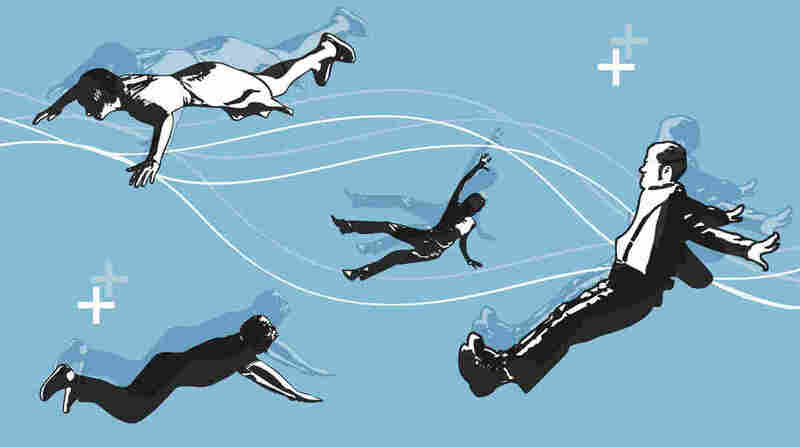 Although two objects with different masses will fall at the same speed in a vacuum, it's not so simple for a skydiver. For one, falling people aren't in a vacuum – they're surrounded by air. While gravity pulls down on a skydiver's mass, air resistance pushes back. When these two forces equal each other out, you've got terminal velocity – the stable speed at which a skydiver falls. "In a normal position for a skydiver, that's around 120 miles per hour," Allain says. Gravitational force depends on the person's mass. A larger person will have a larger gravitational force exerted on him and will need a larger force from air resistance to stop his acceleration. Consequently, larger people accelerate longer before they attain terminal velocity, Allain says, and so they hit the ground at a higher speed. Bigger people also have a larger surface area, which increases air resistance, but Allain says it's not enough to compensate for the stronger downward force due to their larger mass. Famed biologist J.B.S. Haldane, writing in 1928, sums the idea up nicely. "You can drop a mouse down a thousand-yard mine shaft and, on arriving at the bottom, it gets a slight shock and walks away," Haldane writes. "A rat is killed, a man is broken, a horse splashes." What you land on makes a big difference, Allain says. Survivability, he says, is heavily influenced by G-forces – the acceleration force you feel when you suddenly change speed. Soft surfaces are easier on the body because they increase your stopping distance, which in turn decreases the G-forces you feel. So, Allain says that anything that increases a falling person's stopping distance is going to be beneficial. "A good thing to land on might be a tree, because a tree, you could hit the branches as you're going down," Allain says. "If it's a good tree, that could really increase your stopping time and decrease your acceleration." Water could also be a good target, he says, as long as you don't belly-flop. "Water could work," Allain says, "But you want to be like a pencil, and go as deep as possible, which increases your stopping time and decreases your acceleration." But Hamilton says that landing in water has its drawbacks. "You would think that water would be helpful, but water tends to knock people out," Hamilton says. "Then, even if they survive, they may drown." Hamilton says other surfaces — snow, power lines and rooftops — have caught survivors in the past and might be a better option than water. In 2004, for instance, a Johannesburg newspaper reported on a South African skydiver whose parachute failed to open. Luckily, she fell into power lines and suffered only a fractured pelvis, while also escaping electrocution. "Don't land on your head"
Experts disagree on the right way to land, but there is definitely a wrong way. Allain, for one, thinks that landing faceup on your back gives you the best chance at survival. He bases his theory on NASA research from the '60s examining the effects of extreme G-forces on test pilots. "NASA said, 'Hey, we like to accelerate, so let's accelerate some people until bad things happen.' " Allain says. "So they did." The NASA results indicated that humans are most tolerant of G-forces that go from the front of the body to the back, like the type that pushes race car drivers into the backs of their seats when they hit the gas. NASA terms this kind of acceleration "eyeballs in," because people who experience it feel like their eyeballs are getting pushed into the back of their head. G-forces that come from other directions, like the kind that push you into the bottom of your seat ("eyeballs down"), are much more deadly, Allain says. Consequently, Allain thinks that landing on your back, faceup, gives you the best chance at survival because it mimics the "eyeballs-in" position. However, a report by the Highway Safety Research Institute examined 110 case studies of relatively short-distance fall victims and concluded that landing feet-first is your best shot. The rationale is that you sacrifice your legs for the good of your torso. "The body has more deceleration distance when it impacts feet-first," the report reads, "and the long bones absorb a large amount of the impact energy before fracturing." Although there is disagreement on the best way to land, there's agreement on one point. "Don't land on your head," advises Dr. Jeffrey Bender, professor of surgery at the University of Oklahoma Health Sciences Center. Bender has treated numerous victims of falls from varying heights, including a Texas skydiver whose parachute malfunctioned. He explains why people who fall long distances often don't do so well. "It's one of two things: either a severe head injury, or a massive hemorrhage," Bender says. By ensuring your head isn't the first thing to hit the ground, you can at least reduce the chances of one of those things. It's often said that "an ounce of prevention is worth a pound of cure." That's certainly true when it comes to falling out of airplanes. Although people do survive, your chances aren't very good, Hamilton says, so it's better to avoid the situation entirely. In the end, the best way to survive a tumble out of an airplane may be to wear a parachute. Just don't let James Bond take it. We've added more information about the factors that affect the speed of falling objects.